Term 1 practically flew by. January saw them settling down and getting acquainted with their new P6 teachers as only his Math teacher followed them up from P5. February was a short month with CNY festivities and before we can catch our breath, CA1 was upon us and we've come to the end of March! The homework load was as expected, with daily homework from most teachers. The good thing is that #5 does his homework very quickly. Unlike his sisters who waste a lot of time in the lead up to homework (tidying their desk, taking out pretty stationery, filing their notes neatly, choosing the perfect pen from a bulging pencil case, chatting with their siblings), he whips out a pen, thinks quickly and gets through one worksheet after another without dawdling. The bad thing however, is the quality of his work. He has given up asking us for help when he's stuck because the hubs and I spend a long time trying to figure out each question, and his siblings are either too busy studying for their Os or As or they themselves have forgotten how to do it and it becomes very time-consuming. He goes into their rooms and the few of them will be huddled around his worksheet and he emerges 45 minutes later, and there is still other homework to be done. So far he only has Chinese tuition on Saturdays at his aunt's place and I'm still in the midst of looking for a good private tutor for Math and Science. Based on his CA1 results, he has been moved to another class for 3 out of 4 of his subjects. When I spoke to his Principal recently, I brought up the issue of #4's PSLE year, where it was quantity over quality and I asked what would be done to help students prepare for the PSLE instead of shifting the responsibility over to parents and tutors. She promised that they will be keeping a close watch on the P6s this year and true to her word, these kids who need more help have been placed in smaller classes of around 10 students. I was delighted but did have one more concern - yet another change in teachers and 'wasting' time getting to know each other as we are approaching the start of April which leaves us 5 short months before the PSLE (haha, parents are difficult to please right?). Thus when his dear Chinese teacher sent me a final Dojo message that he will no longer be in her class and updated me on how happy she was that he is now participating well and willing to try, I voiced out my sadness especially since he had been making steady progress under her. She reassured me that she had shared her observations with his new teacher who is the HOD of Chinese and that #5 should continue to see improvements under his guidance. It was not easy for #5 to come to like his Chinese teacher and I was not hopeful that he will find another teacher whom he can quickly build rapport with. Lo and behold, he came home and declared that he likes his new Chinese teacher! He related how his teacher was very friendly, did not give them homework, and even told them to write down his handphone number and that they can call him anytime if they needed help. Not just for homework, but if their mothers are angry with them and scold them, they can reach out to him. I was flabbergasted but I guess as HOD he is concerned and has to be especially vigilant with the P6s. Over the years, I have personally heard of several situations where students go into depression, or their minds go blank during the PSLE, and even students going missing because they feared going home to face their parents and police had to be called in. 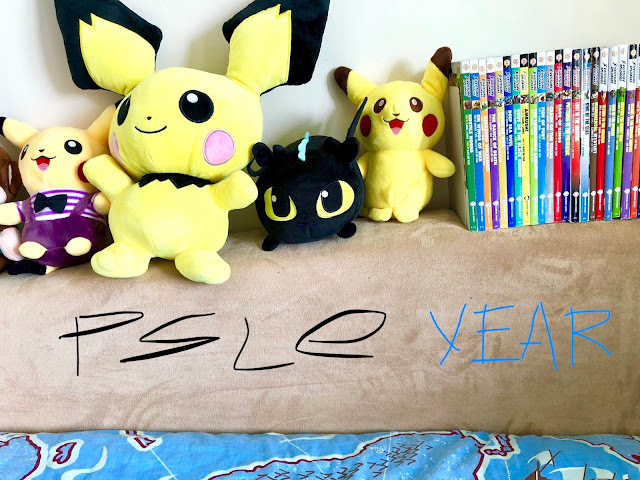 The PSLE is a very stressful year for most kids, sometimes too stressful for 12-year olds to navigate and as parents, the hardest thing is to find the balance between stretching them to reach their potential yet not pushing them over the brink. I have been in close contact with #5's teachers this year, and am really heartened to hear that he has had a shift in attitude and gradually adopting a growth mindset and willingness to push on. His aunt has set him an even more realistic goal for Chinese. Instead of telling him to aim for a Pass, she turned it around and told him "Let's aim to not fail too badly." That took the pressure off him and he now enjoys going to her place every Saturday for Chinese tuition. After going through so many PSLEs and O level exams and now able to look at the big picture, I am more concerned about the mental and emotional health of my kids. So long as he is starting to take his work seriously and has a good attitude towards learning, I am contented. In a way, I'm glad he is still a simple child, joyful (no doubt still mischievous), eyes brimming with excitement and animated when he talks about subjects he loves. One term down, 2 more to go. Jia You all P6s! !